I'm having a hard time not labeling this one Fantasy Fiction just because the lifestyle is only something I could dream up, let alone imagine a reality. ha. Whenever I think about "rich people" I generally think of Hollywood celebrities, Oprah, or J.K Rowling. Maybe Bill Gates. Crazy Rich Asians is about the blue blood, old money, bazillionaires that see Hollywood celebrity money as mere pittance. MERE PITTANCE. Nick Young is about to bring his girlfriend, Rachel Chu to Singapore for the first time. The problem is, Rachel, who has been dating Nick for two years, only knows him as her fellow-professor-boyfriend at the university they work at in New York. She has no idea about his money or that he's Singapore's most sought after bachelor. Not only is he extremely good looking, but he's set to inherit his well-esteemed family's fortune (read *$*$*$*FORTUNE*$*$*$*). It doesn't take too many private plane rides, couture dresses, sprawling estates laden with servants for Rachel to gather that there is more money behind Nick than she could even dream. But Nick's mom isn't having it. She won't have her son marrying a "nothing" whose family came from Mainland China. Especially since she is convinced that Rachel must be a gold digger. She's going to pull out all the stops to make sure that Nick doesn't propose to Rachel. And since every socialite girl in Singapore is willing to try and marry into the Young/T'Sien/Shang family (for the money) it isn't hard for Nick's mom to find help in sabotaging their relationship. What ensues is a maddening, catty, and over the top story of what true love is, what other women will do for money, and where billions of dollars will be spent before you hit page 300. 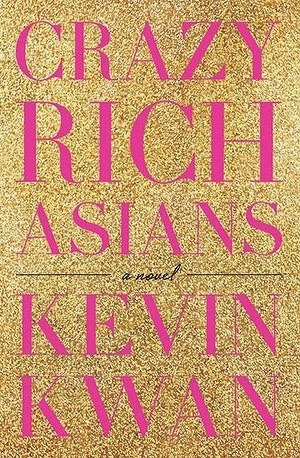 Crazy Rich Asians brings a different character perspective in each chapter. We mostly follow Nick, Rachel, Eleanor Young (Nick's mom), Astrid Leong (Nick's cousin) but there are a few chapters from other characters along the way. One thing I loved is how easy it was to get into everyone's thoughts. Kwan made nearly every thought from each important character within a scene accessible. I came to really like Astrid and Rachel. I absolutely loathed Eleanor. It was fun to dream about being able to take a super fast private jet to Australia just to get a perfect cup of coffee, or going to Paris twice a year so I could drop a couple hundred thousand on some new dresses. I mean, what would it be like to have so much money you didn't even think about money. Kwan's attention to detail made the entire book extremely visual— each victory super satisfying, each "bad guy" downright evil, each outfit perfect, and the food... oh my goodness...don't expect to read this without getting hungry. There were times when it was really awful though. Awful because everyone was so concerned with money, family backgrounds, name dropping, designer clothes, gossip, backstabbing... (I must have learned 10 new designers that I hadn't heard of ever before.) Kwan portrayed a lifestyle and people so realistically (and probably accurately because there were several footnotes along the way for translation and explanations) that I felt like I was really in the middle of it. I did have to take some breaks from it because the gossip and backstabbing and plotting were a little much for me some times. I could never handle that sort of drama in real life, and even though I had to take breaks from it while reading, it was fun to experience that kind of lifestyle and everything that comes with it in the confines of a book. It was so intriguing to see the many different ways people handled wealth. There were so many people included in the story, that I wanted to find out what happened to each of them by the end, and obviously that couldn't happen. Kwan did make sure to give readers some satisfaction and justice after nearly 400 pages of horrible socialites. I wish the ending was a little more sewn up. It was predictable, and ignored any roadblocks Kwan set up to make you think otherwise. It also felt a little abrupt after the detailed, many faceted journey Kwan had set up. But the ending wasn't annoying enough to ruin the whole experience. Nick and his friends take a super-fast jet to Australia after escaping an unclassy, annoying situation so they can get themselves a perfect flat white cappuccino. Aside from the impossibly privileged nature of their escape for a cup of coffee, the scene where they sit and drink the coffee is really nice. I don't drink coffee, but the intrigue of the perfect flat white, apparently only possible in Australia, was enough for it to be a stand out moment. Unless you're in Australia, or rich enough to pop over for a cup, you'll have to make do with the version from your local coffee shop. If you're not a coffee drinker like me, I recommend a steamed milk, since a flat white consists mostly of rich milky foam.